Last Sunday afternoon, around 2.00pm Gordon Anderson and I fished my 1500 meter 65kg dropper rig 11 kilometers north of Rimmer Road on Muriwai Beach. The winds had been very patchy in the morning and all of the kitefishers we stopped and spoke to as we drove up the beach had only just managed to get their kites up. The wind was around 3 to 6 knots, so we decided to put the big dropper rig out with a Power Chute Kite. The kite launched effortlessly and in no time it was at full altitude and pulling on average around 3- 4kgs and occasionally hitting 7- 8kg in the gusts. The wind was probably stronger above the beach but not by much. We baited up 20 traces with mullet and let the rig run out to around 500 meters offshore before attaching a second kite - a Nighthawk - on a 5 meter kiteline to keep the mainline supported clear of the water. 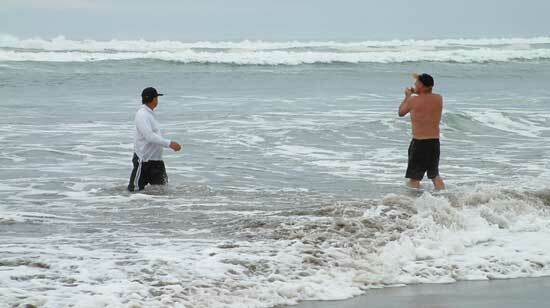 Above : The wind was light and a 1 - 2 meter surf and strong northerly drift made fishing tricky for some. I knew the kiteline on the second kite was too short but it was all we had with us. It took around 20 minutes for the kites to tow the gear out to 1500 meters through the 1-2 meter surf and strong current running up the beach. The Nighthawk kite performed perfectly while the gear was setting, but got pulled down to less than 30 meters above the sea when the full tension came onto the mainline, at the lower altitude the kite was gliding around 30% of the time in the wind lulls. All the bait was gone on the first set and I only managed to catch one small kahawai. I cut that up for bait and put the rig out to full distance again. I only caught one gurnard on the second set and the Nighthawk kite finally went down in a lull. On the way back we drove all the way down the beach, stopping often to check out how the other kitefishers had got on. Just before we got to the creek at the southern end we bumped into Abraham Chin and his son Bronson with their new 65kg Dropper Rig powered by a Megamouth Kite. They had 5 - 10kg of pull on the first set at 1.30pm but the kite was pulling a very respectable 10 - 15kgs when I arrived. They were just hauling their second 20 hook set just two kilometers north of the creek, they had caught five snapper up to 4kg on the first set and we watched as they hauled in another four snapper between 30 - 45cm. 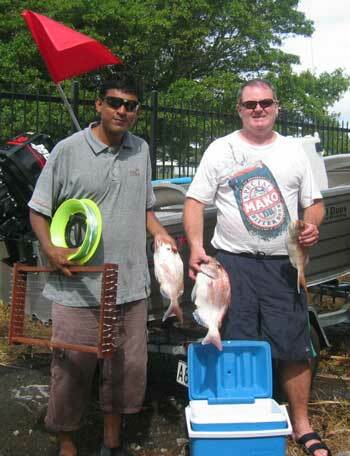 They fished again on Wednesday and caught another nine snapper from two sets totalling thirty hooks. 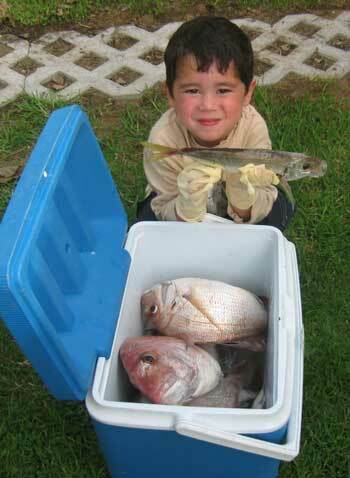 They also caught three really fat kahawai and two gurnard. Everyone using Megamouth or Power Chute kites were also using dropper rigs and got their gear out dead straight and as far as they wanted. They had no problems launching their kites after the light breeze started around 12.30pm. Kitefishers using Nighthawk kites and Skyhooks with dropper rigs all got close to perfect downwind sets, those using the same kites on 100kg longline rigs were affected by the rip - how much depended on where they were on the beach. Most achieved a fishable angle and caught fish. Flexiwing fishers had varied results. Those using the Flexiwing Kite only on 24kg mono had real problems with the rip while most of those using a Flexiwing Kite with 24kg spectra achieved fishable angles. All who used Flexiwing and Skyhook combos got good sets in. Those using both kites on Spectra had the straightest sets. The best fishing appeared to be from 600 -1000 meters out, obviously I had set too far out. Most kitefishers caught snapper, everybody else seemed to have managed to catch more fish than we did. The exception was two purple kites on 60kg longline rigs which utterly failed to beat the rip despite the fact the mainline on them is so light. I think these are the cheap kite rigs recently released on the market. If you have one give Rob a ring on Ph 634-5005, you will need something to give you a lot more power if you want to fish the west coast! 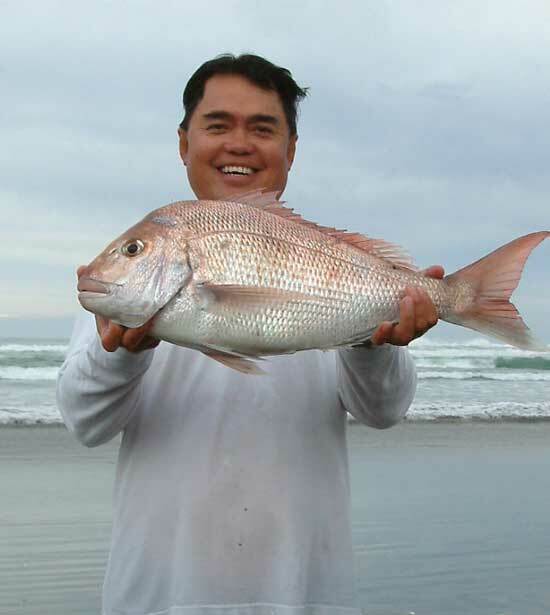 Above : A very happy Abraham Chin with the biggest snapper we saw taken on the day. The south end was the place to be. They set the first set out 700 meters and the second to 1000 meters. We fish mostly at Tokerau Beach but on the 22nd of January we went over to 90 Mile Beach as the wind was in the right direction. We put out five sets and got nine snapper, the set on the full tide was the most successful, we got five snapper on 10 hooks. 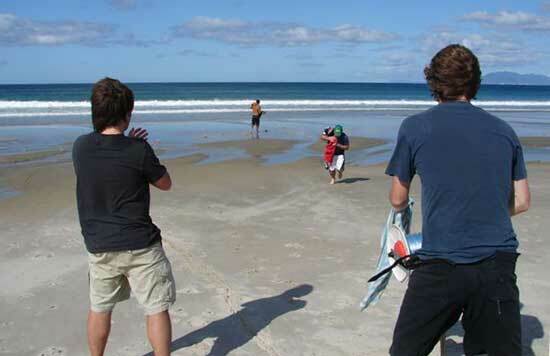 There where lots of other kite fisherman on the beach as well. Three out of our five sets went out straight, the other two got in the drift. But we still had a good day. By the way we were over at 90 mile in December and we were having trouble getting the kite up. At last away it went, nice and straight, then it started to drift down the beach, then onto the sand, then up into the sand hills. Guess who had to clamber up the sand hills and retrieve the gear. Fortunately nothing was lost in the windshift. What a day but thats fishing! Hi Guys, I picked up a second-hand kite a couple of weeks ago (one of your earlier super kites that had very little use from previous owner), so decided to have a mid-week play at Muriwai on 14 Dec.
We had planned an evening fish from the picnic area...only didn't realise that the access gates are locked at 8.30pm so we only managed one set before we had to head off the beach. The Super kite went up first attempt, but by the time we got to the dropper section the wind was getting patchy so we brought it in and added the Sky Hook. What a brilliant addition this is! The extra pull had the gear out in no time at all. 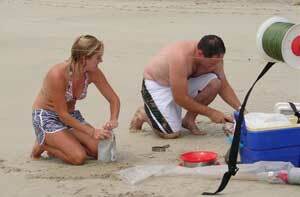 10 hooks for four fish, and we were on the beach for less than one and a quarter hours. My fishing buddy, (a kite fishing virgin), was so impressed he is already planning a trip to the PFK shop in Onehunga to get his own gear. Cant wait for the next trip! ED : This report is from the end of November, it got lost in my system. Sorry about that Barrie. Chris and myself got the first set of our kite longline out three hours before the low. We baited up with mackerel and were hoping to catch a kahawai for baiting the next set. After an hour it was time to bring the line in and yes we got our kahawai along with four gurnard and a snapper. The next set was baited up with the fresh kawhai and left set 800 meters out for an hour at about , we had a good steady wind and the four litre float was 3/4 filled with sand. This set produced a small sand shark, four snapper (one at 30cm, put back) and five gurnard. All the gurnard were above average size (950gm-1.4Kg) which was even better. While the wind was still with us we put out another set, unfortunately we had to resort to trevally as bait as we had run out of kahawai, consequently the only fish we got on this set was a kahawai. At this point we decided to call it a day as the tide was coming in. All in all a good first time out this year with the kite, as the wind is not always in our favour down here. A few hauling acton shots from a sojourn to Pakiri Beach a few weeks ago. We fished two bottom longline sets, with no tacking and the gear set directly offshore. Unfortunately, our setting pace was too slow and we didn't have our skyhook. Our baits were stripped by crabs - although we did bring in one large paddle crab. Next time we will take the Skyhook and some Floating Bead traces. We also lost a flexiwing kite flown from a rod, after a mysterious incident - the kite went missing as we were pulling in the line. We suspect a knife protruding from someones pocket! Monday of Auckland Anniversay weekend was not an early start. The beeping of a text message on my cellphone was irritating enough to get me out of bed at 9.10 am. The text was from a workmate and said simply "fishing?" I looked outside, it was hot and fine with a hint of an easterly. Not ideal fishing weather for me, I prefer an early predawn start to avoid the heat of the day but I texted back a "yes" and then had a hasty breakfast and packed the boat. High tide was 9.30 am so we would fish the outgoing tide. Not absolutely ideal but better than being at home mowing the lawns. I should mention that the proceeds of my birthday the week before had yielded enough to the last cent to buy a boat longline from Pauls Fishing Kites. The birthday bash cost more than the longline, but luckily I have never been one for too much maths. So as you can imagine I was dead keen to try it out (and increase my stature as the provider at home). By the time Dhamendra arrived it we were almost ready to go and at 10.15 we were on the way to Kawakawa Bay with a four year old hanger on (my son) in tow. A quick stop at Clevedon for bait (fresh mullet was all gone so had to get frozen) and some words of advice from the ever friendly guy at the bait shop ("no one's catching anything mate") and we continued onward. Launching my Quintrex tinny doesn't usually present a challenge but improvements in progress at the Kawakawa boat club ramp ensured that there was a traffic (boat jam) which made for a few frayed tempers (not us) and we were soon on the way. We headed out into the Firth of Thames out to the 20 metre mark roughly between Ponui Island and Orere Point. After anchoring and working out the current direction (outgoing) and the wind (easterly) the bait was cut up and all the traces were baited while the traces were in the trace holder. Now a big thank you to the boys at PFK shop in Onehunga for patiently explaining to me (several times) how to set up, deploy and retrieve the long line. Over the back with the buoy, motored away quietly while the hand spool letting the line out. On with the grapnel anchor (on the pre tied bridle) and then the mainline was steadily going out. First hiccup, the person attaching the traces via the sea harvester running clip needs to be onto it. The boat speed needs to be reduced to give a slower rate of mainline deployment. This done it was a simple matter of me holding the handspool at about shoulder height and counting two knots off and Dhamendra clipping on the next trace. Once we had the speed right and the routine happening it was very smooth and within 5 minutes it was all done. On with the other grapnel and finally the float with the flag (was I glad of the flag later) and it was all done. Because we set across the current at about 40 degrees with a little speed and tension on the main line there were no noticeable "bends" in the mainline, it was nice and straight. We motored away about 500 metres and enjoyed a well earned cup of tea and a line fish. After 40 minutes with no legal keepers coming on board we motored quietly back. Always have a buoy with a flag, I doubt we could have located the longline without it. As instructed we went to the down current end to pull up the grapnel anchor and remove it. Bring a boat hook or a gaff. It is very difficult to grab the buoy otherwise, thanks to fantastic piloting skill (or was it luck ?) Dhamendra managed to get the buoy in on his first attempt. We pulled up the buoy and let it go while pulling up the dropper line and removed the anchor. A quick dash to the other end, a repeat of lesson number two and we were soon drifting quietly and retrieving the mainline onto the handspool. We were cautiously optimistic and soon I could feel pulling against the mainline. The first couple of traces were empty with no baits left and then we saw the familiar red and silver colour as the first snapper came into view. A good size it was too. We carried on retrieving, Dhamendra put the traces back on the holder and we left the snapper temporarily on the floor in the boat with the hooks still in their mouths. Next problem, the mainline got very heavy and the next 3 traces were all wrapped around the mainline with no fish in sight. Untangling them was easy unlike what happened next. Suddenly there it was coming up on the next trace a very unhappy looking five foot hammerhead shark. I voted to cut the trace off, but Dhamendra a long time Fijian fisherman was not keen to give up a brand new trace and hook. We pulled the hammerhead partly on board for some dental surgery. The little hook disgorger I had (orange handle will float if dropped overboard, $14.95 at the boat show) was way out of its league for this sort of challenge. What was needed was long nosed pliers (I have three pairs at home). Outstanding feature of the target snapper hooks is that fish are nearly always hooked in the corner of the mouth so it was relatively easy to free the hook using the less risky approach i.e. the point of the bait knife. Mr hammerhead was put back to terrify other longliners on some other day. Total catch on the first set was five good sized snapper. Reset the longline, much easier now we had the technique worked out and motored away for another rod and reel fish. By now it was about 1.15pm and a pod of dolphins swam lazily by. We had seen five shark fins by now also cruising around and had passed two rafts of penguins on the way out so the scenery was nothing short of spectacular. Didn't have high hopes for the second set (all the shark fins and the sun was very hot and bright). On retrieving the long line for the second time we were surprised to have another five snapper (one undersized and returned) and a couple of quite large mackerel. By now it was really scorching hot and all of our cold drink was gone. So, much to my 4 year old's disgust we started up the motor and headed back to the boat ramp. It was dead low tide and the public ramp, which I had hoped to use, had only a foot of water at the bottom of it and I saw that other fishos couldn't get enough of their boat trailers under the water to get their boats on. Plan B: Back round to the boat club ramp (and yes I am a member unlike most of the other boats I see there) and, oh no! It was like queen st on a Friday night. I used the old trick of motoring up the edge of the ramp and stopping in front of the temporary pile of rocks next to the ramp (can't do that in a fibreglass boat). During the half hour wait to retrieve to boat onto the trailer I had a chance to talk to other fishos. No one else had caught anything much, there were lots of theories why the fishing was slow. The fishing calender showed the day to be "fair" for fishing with a 30 minute bite time 1.30 to 2.04 pm. Off home, cleaned up the boat, divvyed up the catch and had nice fresh snapper fillets for dinner, enough for everyone. On what was a poor fishing day, two sets of the long line yielded 12 fish (not counting the shark) and one snapper returned (undersized) resulting in a 20% catch rate. Fishing with two rods over a similar time period yielded few bites and no keepers. Not hard to work out what was the best bet on the day. I won't set the longline everytime I go out, as I like to contest the fish on my 4 kg outfit, but when the fishing is hard and time is limited (marginal weather) I can see it as a useful weapon in my armoury. The trace rack is a brilliant idea and everything is click on and click off, quick and easy to set and retrieve. Had I bought a cheaper (inferior) longline from somewhere else, I am sure that we would have struggled to set and retrieve it (we have all heard stories of long lines tangled around props etc). Congratulations to Paul and the guys in the shop for a well thought out and engineered product and good advice on how to successfully use it. Ed: Thanks for a great report Ross, I am sure it will be a great help to many boat longline novices.